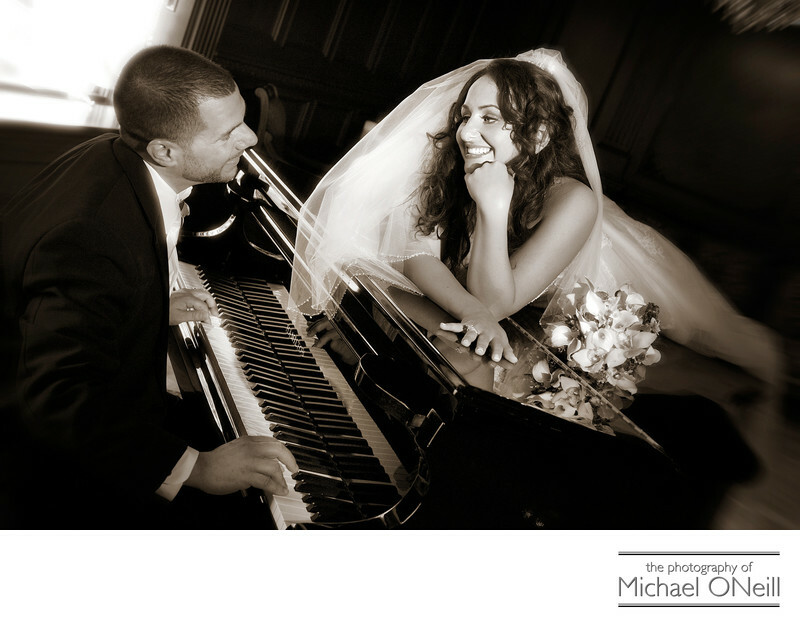 Gotta’ love this playful image of the bride and groom posed on the grand piano at The Inn at New Hyde Park, one of Nassau County, Long Island’s finest wedding catering venues. This is just one of the beautiful interior locations in this facility that underwent a major renovation a few years back. The spectacular ballrooms are the perfect place for you, your families and friends to dance the night away on your wedding day. Outside there are magnificent garden areas perfect for taking wedding pictures with your bridal party: brides maids, groomsmen, maid of honor, best man, flower girls and ring bearer. The grounds even include a small bridge for romantic pictures of the bride and groom. The meticulously kept gardens provide the perfect backdrop for wedding photos. I am experienced in taking pictures at The Inn at New Hyde Park and would feel privileged if you choose me to be the photographer chosen to capture your memories on your wedding day. Give me a call.